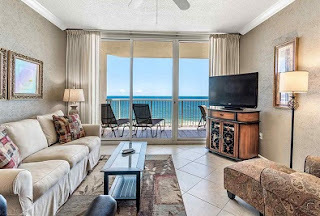 Gulf Shores Alabama beachfront condo for sale at the Beach Club. Bristol 1003 is a magnificent 3BR/3BA upscale luxury condo at the beach club with direct Gulf views from the living/dining/kitchen, master bedroom and huge balcony! Upgrades include: crown molding, tile throughout, washer/dryer, HVAC, appliances, water heater and lots of unique finishes. Owners are allowed to bring pets but with restrictions! – don’t let this one pass you by!